At 380 metres above sea level this alpine village is often blanketed in snow in winter, transforming it into a winter wonderland. However, it is a spectacularly beautiful place no matter what the season! The alpine village of Hanmer Springs offers visitors a rich variety of experiences and adventure. Forest walks, mountain biking, alpine hiking, mini-golf courses, pitch and putt golf course, 4WD safaris, 4-wheel motorbike hire, horse trekking, trout and salmon fishing, health and massage centre, thermal pools, whitewater rafting, jet boating, bungy jumping, skiing and heli-skiing, shopping and eating out, scenic air flights, cafés and dining; Hanmer Springs has all of this and more! Events held in Hanmer Springs include Rainbow Rage, Mt Isobel Challenge, 4/8 hour mountain bike race, duathlons, Molesworth Muster, half marathon, Jazz and Blues Festival, Health and Wellness Festival. 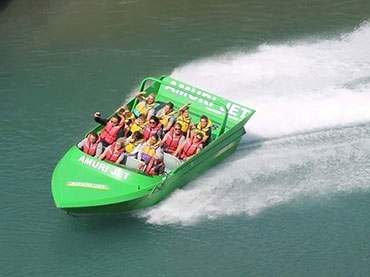 Since the establishment of the Amuri Jet in 1985, thousands of visitors to Hanmer Springs have thrilled to the unique experience of Amuri Jet. Jet the entire length of Hanmer's spectacular Waiau Gorge, following the contours of the steep canyon walls where possible, it's elbows in, as you pass within centimetres of rugged rocks and cliff faces. Take in the magnificent scenery, then hold on while you experience the famous Hamilton 360-degree jet spin. Excitement plus! The best place to indulge, with a range of pools including relaxing rock pools, soothing sulphur pools, an array of water jets and bubbles – at different temperatures. Plus a luxurious day spa with a range of beauty treatments, massages private pools, sauna and steam rooms. The best place to act like a kid, with an activity pool, lap pool, lazy river, water slides, garden picnic areas and the Tea Kiosk Café & Grill. Quite simply – the best place. 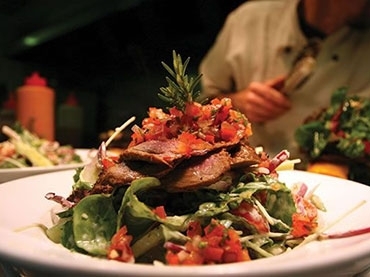 Whether you're after a quick bite to eat or a five course fine-dining experience – you'll be well catered for in Hanmer Springs. The village has a variety of cafés, takeaway shops and a bakery for those wanting a quick bite to eat. There are also plenty of casual dining options – from pizzas to quality bar meals where you can relax and enjoy a drink while you dine. The village also has several high-end restaurants which make the most of the incredible local produce with service that is world class. 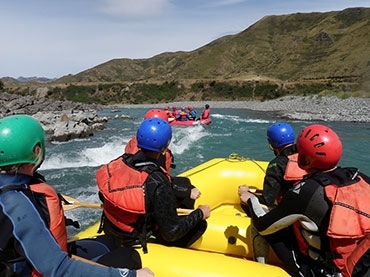 Experience the thrill of River Rafting on the Waiau Gorge with Amuri Alpine Rafting! Your adventure begins when you depart from the Amuri river base and head down stream on a scenic trip through the stunning Waiau Gorge. Be in awe of the dazzling landscape that surrounds you as you float on this pristine river. There will be the opportunity for a swim and to jump off rocks into the Waiau's crystal clear waters or you can simply relax and take in the outstanding scenery as you float down stream. Next up is an adrenalin pumping ride through the Waiau's Grade 2 rapids... full on fun for all the family! The finale of the trip will be an exciting journey by jet boat back to the Amuri river base.